We’re launching a 3-tiered network to help spread spiritual light around the Earth and to help wash away spiritual darkness. Tier 1, as I wrote in the last article, is for front-line world servers… those sensitive, gifted men and women who have that uncanny, innate knack of cracking the veil to spiritual realms. They see, hear, or get impressions from the other side, and strange, other-worldly things often occur in their presence. It’s not a skill they’ve developed; either they were born with it or they suddenly acquired it at some point in their lives. These will be the people at the grass roots of our network, and the most important part of the network… the innate sensitives of Tier 1. Tier 2 will consist of light workers who frequently get in touch with the finer realms of spirit, through meditation. We will nurture a growing network of these proficient, disciplined meditators. They’ll be the source of light, love, and peace throughout the network. They’ll be in the habit of going to center on a daily or near-daily basis, to find that inner peace that is the anchor of every great spiritual tradition down through the ages. These second-tier world servers are the subject of this installment. … just to name a few… do we really need another world meditation project? What makes this one any different? Well, first off, it’s safe to say that humanity can never have too much meditation. Every good meditative session raises the spiritual vibration of the planet just a little bit… and a rising vibration indicates world movement away from fear, hatred, and chaos… toward love, understanding, and peace. So, yes, we do need another world meditation project. We need a thousand more, a million more. What sets this meditation network apart from the others is its primary purpose. The main mission of the Tier 2 meditators is to provide support and protection for our front-line world workers in Tier 1. Our front-line, first-tier spirit facilitators are working directly with the dark, dismal spirit realm that covers our planet like a soiled blanket. They’re removing the blanket to cleanse and heal. They’re piercing the veil as though it were inflamed skin on a boil, to expose the festering mass to the light. Tier 1 world workers are doing mankind’s dirty work, like a team of triage physicians, and they need all the support they can get. Tier 2 world workers provide that support. To give you an idea of the festering conditions in the shadow world, here’s a closer look at the photo taken by Carly this month and published in the previous article. Here we zoom into various parts of the photo that seem to show members of a community of spirits in that dark, shadowy spirit world that’s superimposed over our physical world. This photo (adapted from the previous article) appears to be part of a spirit community in the second spirit level or shadow world of the Earth. 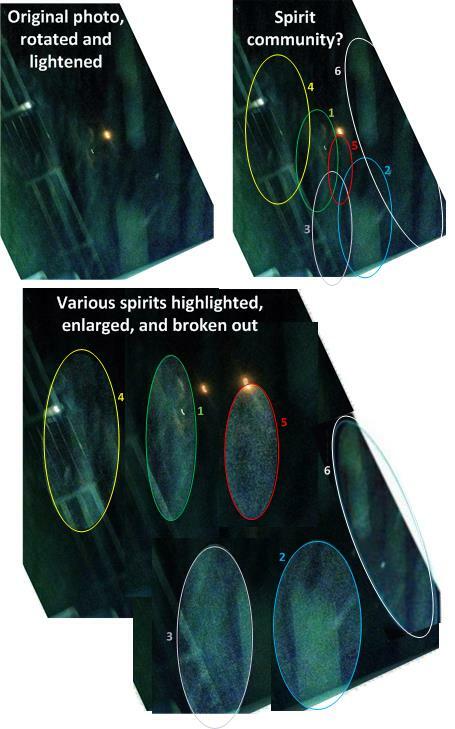 These are what I perceive as some of the spirits in the picture, listed numerically, in the order of how clear and easy they are to identify, starting with the clearest: 1) an unclothed man standing in profile; 2) a black-haired man in a long, beige suit coat with arms raised, also in profile; 3) a girl in a dress walking toward our right; 4) three or four men and women standing near the unclothed guy; 5) a man in a long, dark coat standing in profile; and 6) some higher beings descending onto the scene. (Granted, some of my interpretations may be a bit of a stretch.) Some of the figures are not easy to make out… but perhaps you get the idea. It’s not a beautiful, paradise place, this shadow world. It’s inhabited largely by lost souls whose troubled thinking spills over into our world. The hands-on, healing work of Carly and sensitive people like her would be easier, more pleasant, and a lot more effective if a good team of meditators were behind them, streaming finer spiritual energies, or ethereal light, into their lives and their work. That’s the main mission of our project… to cleanse, heal, support, and protect. The main mission of Tier 1 is to help cleanse and heal the Earth of its dark, spiritual residue, and the main mission of Tier 2 is to support and protect Tier 1 with light. Get in the habit of meditating as often as you feel comfortable… daily, or near daily… or even several times a day. The more you meditate, the better it is for everyone. If you have a time-proven meditation technique that works for you, you’re welcome to use it. Spend a few minutes clearing and connecting. This is contemplative time to think about the most important things related to our work… about God’s omnipresence and omnipotence, about the people involved in the project, and about how we’re all connected to God. Then release all of that. Do whatever works best for you to clear the mind while entering a meditative state… repeating a mantra, focusing on your breathing, counting down silently from 100…. Bring nothing into the meditation except resting in God. Leave all the thoughts, preoccupations, intentions, and earth clutter behind. Listen in complete peace and inner quiet. Trust that light from the source will be channeled through you and the network to wherever it’s needed at the moment. We’ll probably come up with a recommended (and optional) meditation regimen like the bullet list above as our project gets on its feet. If you prefer meditating in solitude, that’s fine. Meditate whenever and wherever you wish. If you prefer meditating with others at an agreed-on time, there will be opportunities and means for arranging that. You can join a global triangles group like those that evolve within the Lucis Trust. Or you can meet in the same place with friends of like mind to meditate together. Or you can meditate through one of the many existing world meditation projects listed earlier. We’ll probably post an optional daily meditation hour (again, as our project gets on its feet), during which time anyone can “plug in” to our own worldwide network of light. That gives a nice general overview of Tier 2 of our project. In the next article I plan to explain how the dark, shadowy world originally formed around the Earth and how it’s sustained itself across the millennia. It’ll give us a better idea of what we’re up against with our new project of world-cleansing. It’s a fascinating story, based largely on what I’ve learned (about the destruction of Eden, the rise and fall of Atlantis, and the “fall of man”) through ITC research over the past 25 years. There’s some speculation involved in the story, again, based on a lot of solid evidence that I present in The Human Story articles. In fact, this upcoming article was inspired by a comment by reader George posted last week on one of those articles, which I began to address in-depth… until it became clear that the amount and quality of information deserved an article, not just a comment. This entry was posted in Uncategorized and tagged cleansing the earth spiritually, global meditation, world peace projects. Bookmark the permalink. A valuable writing. Thank you Mark. I’m with you all the way, Mark. Not a sensitive or good with technology, but I can meditate.